Willy Wonka stretchy & tangy laffy taffy bars in 3 assorted flavors. Each box of laffy taffy comes with Sparkle Jerry Cherry , Herman Grape And Wally Watermelon everyone's favorite flavors. These are the 3 most popular flavors of tangy taffy all mixed in one box. 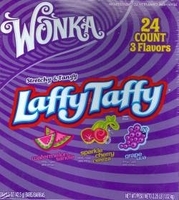 If you prefer the bite size laffy taffy we also have that in our wonka candy section along with all of wonka's favorite treats.The famous wonka candy bar, Nerds, Bottle Caps, Everlasting Gobstopper, Fun Dip , Pixy Sticks even Willy Wonka Candy Baskets for those that just love wonka candy. Each box of stretchy & tangy laffy taffy comes with 1.5 oz. bars of yummy taffy. I am 18 years old and I just recently found your website,browsing through all the different types of candies you sell was seriously "a blast from the past" it brought back so many memories from being in elementary school with my best friend Dallas eating Carmel apple pops at recess on the swings,or going to the bank with my grandpa and getting a saf t pop! but most of all my favorite child memory would be getting a willy wonka strechy tangy taffy after a doctor visit from my mother,I was terrified of shots when I was a little girl,so basically every time I was told I was going to the doctor I would cry thinking I was going to be getting a shot,so everytime I acted good for the doctor my Mother would go buy me a willy wonka strechy tangy taffy,watermelon of course because it is the best flavor or all time! well I hope you all enjoyed my candy memory.